It is time to trim our collection of Christmas memorabilia. We decided to spend the morning sorting. When we were first married, while Ted was still in law school, we didn’t have much money to spend, but each Christmas we would buy a small figure of an angel and one of a Santa. The tradition stayed with us and now 53 years later we have dozens and dozens. Time for some sorting and thinning. Silly Santas had joined the collection as well as stuffed Santas, a Santa stapler, a napkin holder, things that really didn’t add to the of meaning of the collection. So we began tossing. 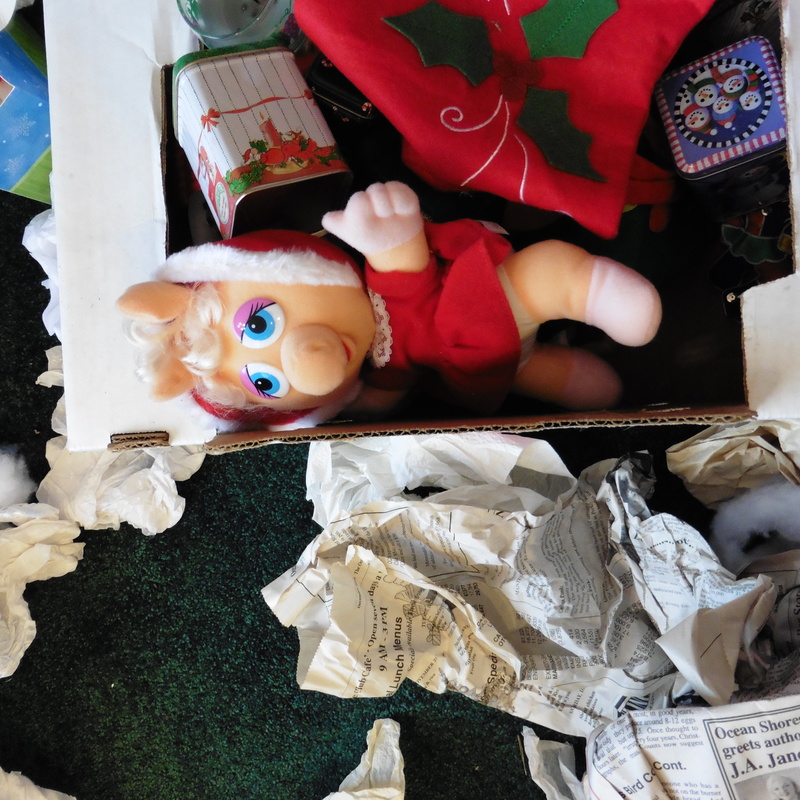 Miss Piggy is gone now, along with this box of odds and ends. Miss Piggy in a Santa costume was easy to toss and a few others as well. Then we got to bins with things like the tin of half burned candles. Out. A box of ornaments carefully wrapped in paper dated 1987, which should have been tossed then, went out, they had not been opened since then. Tarnished? Chipped? Out they went. 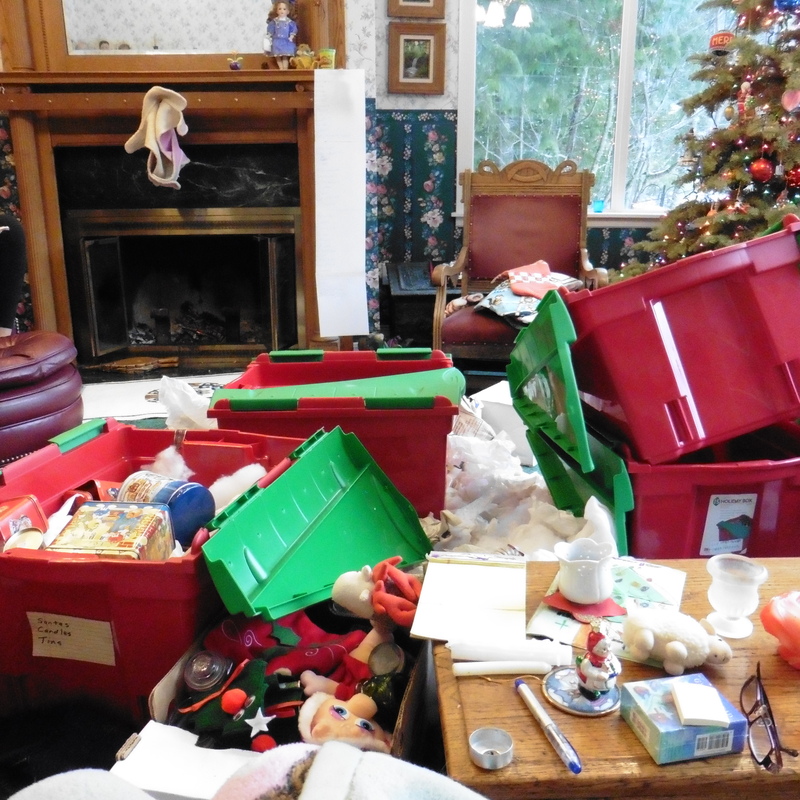 Dozens of Christmas stocking most belonging to children who have lived with us. 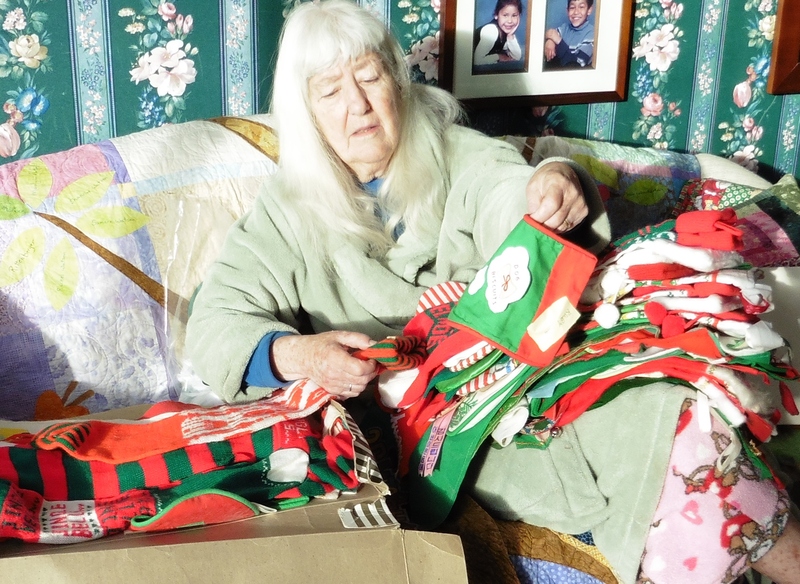 Next were the Christmas stocking, all of our kids, grand kids, foster kids and a few assorted others, had stockings with their names on them, no matter how many years had passed since they spent a Christmas with us.. These I could not part with. Each brought special memories, especially the two that had belonged to our sons who are no longer living. My childhood stocking. My mother embroidered my name on it. Two of these stockings belonged to our first born children and the Hawaiian Santa belonged to my father. We sorted through all 12 bins. We sent two boxes to the trash and sent three boxes to the Good Will. And brought our total down to 8 bins. It is a start! Not an easy project. Tanner and I want through his room yesterday – top to bottom. He is quite sentimental and did a pretty good job of tossing. And now you will come to Bellingham, Merrily, and help me do the same, right? Happy New Year to you, Ted and the kids. I love these posts.